The crop top is one of those cult garments from yesteryears that come back into style with a resounding bang, as though it had never gone out of vogue in the first place. The last two years have seen the rise of the crop top, made more popular still by all of the celebrities who swear by the classic piece – Kim Kardashian is the perfect example. I am well aware that thought of exposing some belly can be intimidating for many women, and a common belief lingers that crop tops can only be worn by the “size 0 clan.” Ladies, I am here to tell you that that is absolutely untrue! Woman of every size, height and shape can rock crop tops with flair and the ten tips that follow will help you do just that. 01. Pair plain crop tops in shades of black, grey or white with statement bottoms like printed Jodhpur pants or a bright midi skirt, which will divert the attention from your crop top to the eye-catching piece. 02. Take baby steps into the world of crop tops by pairing the garment with high waisted bottoms. This will minimize the amount of skin that can be seen and make you feel more comfortable – an ideal style for voluptuous ladies. 03. If you have not been working on your summer abs as you promised yourself, never fear! Sport a loose, boxy crop top, which will conceal any stomach problems you might have. 04. Balance out the show of skin by pairing your crop top with understated shoes that are low heels or completely flat. When it comes to styling the rest of your outfit, less is always more! 05. Is this your first time wearing a crop top? Are you anxious about showing your midriff? All you have to do is throw on a cute jacket and say goodbye to those butterflies! The first time I wore a crop top, I paired it with a cream coloured boyfriend blazer and felt so comfortable. 06. Another way to keep covered is to sport a crop top with long sleeves or a high neckline. These details work really well when you are planning to sport the top at a more formal and sombre occasion, too, because they add a touch of sophistication to the look. 07. 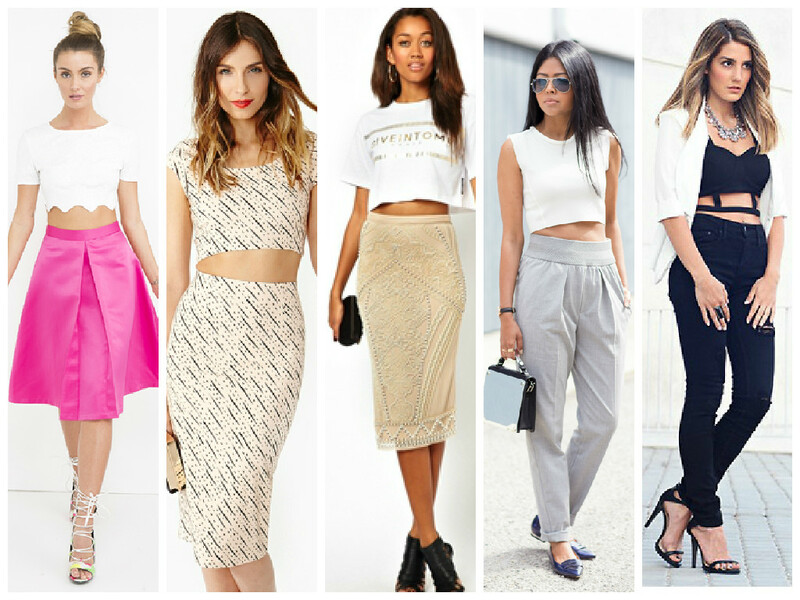 If you are not ready to sport a crop top on the streets yet, that is totally okay. Why not use a quirky crop top as a beach cover-up on your upcoming summer vacation? Easy and chic! 08. Pairing your crop top with a long necklace that falls just above your navel is a great way to elongate your torso that may otherwise look shortened by the top. 09. Try coordinates! These combinations are the perfect way to wear a single print from head to toe without looking like fashion road kill. Coordinate sets usually come as a crop top with a voluminous skirt or high waisted shorts. These work well because the sliver of skin breaks the intensity of the print. 10. Kill two birds (ahem, trends) with one stone by pairing your crop top with cute overalls for a fun, playful look! This combination works well because it keeps your stomach covered but still shows some subtle skin from the side. Again, this outfit is ideal for those of us who haven’t achieved our summer bikini body just yet.